The best way to increase awareness about your community and knowledge base (KB) and drive traffic to them is to link to them anywhere and everywhere you can--especially where your customers are. You agents can help you do this. As they answer tickets each day, and interact with customers, they can link to content. This will make customers aware that the content exists, and train them to look there first next time before filing a ticket. There are other places in your Zendesk, besides tickets, where you can add links to the top-level of your KB or to specific content. And there are also opportunities outside of your Zendesk to add links. Don't miss out on these opportunities to enable your customers to self-serve. Note: Thanks to the contributors to this article: Sean Kinney of Zendesk, Katie Wilcox, Allen Lai, of Bitcasa Todd Zabel of Hearsay Social, and Andrew of BizStudio NZ. Agents can be key to increasing awareness of your knowledge base and community and training customers to go there to self-serve. Introduce new agents to existing content. When you train new agents make sure they know about your knowledge base and encourage them to get familiar with the content there. They should have a good idea of what's documented and be able to easily point users to it. Keep agents informed about new content and updates. Develop a system for letting agents know when new or updated content is available. Then they will be more likely to use it and link to it. One way to do this is to create a private "Agents only" section in the knowledge base where you announce doc updates and ask agents to subscribe. Establish a process for linking to content. Train agents to search for content and include links in tickets as part of each support interaction. Even when an agent knows the answer, if it's covered in a doc, it's a good idea to include a link along with the answer. This way customers learn that content is available and they might search for answers themselves next time. Agents can also include links to related content, too, when solving tickets as a way of increasing KB awareness. Provide easy access to the KB and community. The less time it takes agents to go to the KB or community to find content, the more likely they are to do it. You can add icons for your KB and community in the sidebar of your Zendesk to provide quick access. For information, see Providing agents with more information using the Iframe and Text apps. Provide search in the ticket page. Again, the easier it is for agents to find content the more likely they are to link to it. You can add search to the ticket page so that agents can easily search for articles, tickets, comments, users, or organizations in your Zendesk. For more information, see Installing and using the Sidebar Search app. There are many places within your Zendesk where you can link to content. Agent signatures (in public ticket comments and outgoing emails) An administrator can add a common signature for all agents that includes links to your KB or community. Or an agent can add a personalized signature that includes a link. For information, see Adding an agent signature to ticket email notifications. Reusable responses in tickets (macros) Create or edit macros to include a link to your community, KB, or a specific article. For information about creating and editing macros, see Using macros to update tickets. 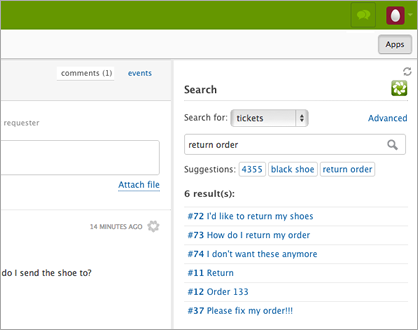 Ticket comments Agents can manually link to content in ticket comments to answer a question. They can also include links to related articles when answering tickets. To insert a link in a ticket comment, copy and paste the link in the comment area. Auto-response emails for received requests Edit the Notify requester of received request trigger to add a link to your community or KB. For example: "While you're waiting, check out our Help Center! There you will find answers to common questions and issues, FAQs, a community forum, and more!" For information about editing triggers, seeCreating and managing triggers. Edit the Notify requester of solved request trigger to add a link to your community or KB. For example: "Your ticket has been solved! To reopen this request, reply to this email or click the link. And for more help, be sure to check out our Help Center for answers to common questions and issues, FAQs, a community topic, and more!" Another option is to clone the trigger for solved requests to create different versions for different major support issues. Then include links to specific, related content for each issue in the trigger. Agents can select the issue in a custom ticket fields to fire the appropriate trigger. For example, "Your ticket about installation has been solved! If you need more help, see the Installation section in our Help Center!" For information about editing and cloning triggers, see Editing and cloning triggers. Promoted or pinned articles on support home page You can surface content and increase awareness by promoting articles to your Zendesk Support home page and rotating content. For the Help Center, see Reordering your content. There are opportunities outside of your Zendesk to drive traffic to your community and knowledge base. Product Links to articles in product. For example, include a How do I use this feature? link to context-sensitive KB topics. Community Tip from Tom Corbett! We have an in app assistance icon, this actually pulls in articles using the API which relates to the page you are on. We have found people prefer this experience. For example, welcome emails and follow-up emails after events or webinars.